Blackjack is also called 21, pontoon or vingt-et-un. It is a very popular card game in casinos all over the world, thanks to a mixture of luck, decision-making and skill, as well as the publicity of card-counting, where players can change the game's odds to turn in their own favor through strategic decisions and proper betting. When it comes to blackjack, players play versus the dealer instead of one another. 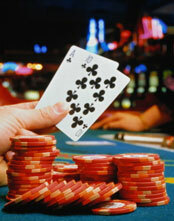 Each player's goal is to get a high point total close to 21 without exceeding it and beating the dealer. Each hand's card value will be added as follows: cards 2 to 10 have their own face value, face cards have a value of 10 each and Aces can either be worth 11 or 1 depending on the player's preferences. If the dealer and the player have the exact same total in points, no one wins that hand. After placing the initial bets, the dealer will deal the cards from either a single deck or from a whole shoe with around four decks in it. Every player gets two cards each, including the dealer. The dealer will have one face-up card and one face-down card, though, while the players get their cards dealt face-up. If a player gets a blackjack right away (a 10-value card and an Ace), he will instantly get a pout of 3:2 unless the dealer gets a natural, too. If he does, every player will lose instantly and not get the chance to get better hands. However, if he doesn't, the dealer will give each player a chance to get more cards or stick to their total. The player can keep asking until he exceeds 21 or is happy with his total. Also, depending on the player's cards and on the table rules, the player might get the chance to perform certain plays. If he busts, though, he will instantly lose his bet.